Mr. Bathing Ape, A Bathing Ape‘s more formal and refined designer arm, presents its 2013 spring/summer collection of ties and bowties. The collection is, as might reasonably be expected, full of that signature BAPE camouflage in a host of summer colorways. Traditional ties are available in green, blue and pink-based camos while bowties are offered in a blend of green and pink or green and blue camos. The Mr. 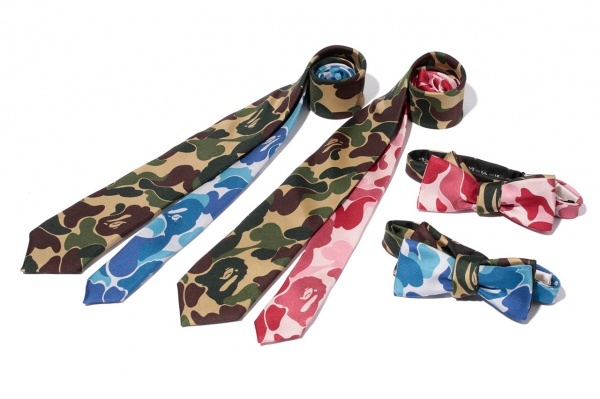 Bathing Ape 2013 spring/summer tie collection will be available in-store and online. This entry was posted in Accessories, Ties and tagged Bowtie, Camouflage, mr. bathing ape. Bookmark the permalink.